I refuse to believe it until I am knee deep in snow or slipping my way down the icy driveway to collect the mail. It's not that I don't like snow. In fact, I desperately want to be snowed in. It's a throwback to my stay-at-home mom days when wintry weather meant that I could stay in the house for days on end, leaving the driving to Mike and smiling as I looked out on inches of snow while I sipped hot chocolate. We've had plenty of snow this winter, but not enough to shut us in. Just enough to be a nuisance. I've been trying to ignore the weather updates that show up in my Facebook newsfeed and only listening with half an ear to the weather reports on the local news. I refuse to let those dang weather people get my hopes up. To be fair, the guy on NBC tonight did suggest that there is a chance that all we will get here is rain. 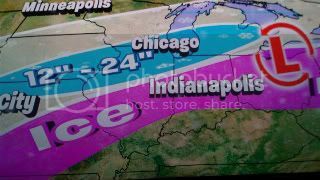 But while he was saying that, my eyes were focusing wistfully on the swath of blue indicating that northwest Indiana and the Chicago area could get anywhere from 12 to 24 inches of snow. Yesterday, Charlie started complaining that his left ear was hurting. Because his complaint came about 10 minutes before it was time to walk out the door for school, I smelled a rat -- or at least a faker. I gave him a dose of ibuprofen and sent him on his way. No word from the school nurse yesterday. No complaints after school. He played without hesitation in his basketball game last night. (We won! On to the semi-finals!) He didn't say another thing about his ear and I forgot about it. Until 3:30am. When else do those things flair up? I was asleep on the couch, so I didn't hear him calling for me at first. But eventually he got my attention and was obviously feeling the pain. I gave him some ibuprofen, pulled out the heating pad, and laid down next to him. 30 minutes or so later, he was still crying out, so I gave him some cold medicine to clear out any congestion in his head. Good idea, Mom. Except that 20 minutes after that, he was crying that his stomach was hurting. Probably from all that medicine on an empty stomach. Ugh. I sent him to the bathroom. Rubbed his back when he returned, and headed for my own bed after he finally fell asleep. I try not to run my kids to the doctor for every little thing. But I have a rule for ear pain, coughs, etc. : If it interrupts MY sleep, off to the doc we go. We've been down the ear infection road plenty of times before, so I was pretty sure that's what it was. So this morning, before I even got out of bed, I called the pediatrician's office and made arrangements to bring Charlie in to the drop-in clinic. I told them we could be there in 20 minutes, which was a little short-sided, given that I wasn't even dressed and we live 15 minutes away from the office. Charlie and I were ready to go when I realized that Mike had gone to work in the car where I had left my keys last night. No problem. He works about 5 minutes from home. I called his cell phone to ask him to run the keys home. Crap. I called him at work, marginally optimistic that I would get through the after hours answering machine. No luck. Now what? The doctor's office hours on Saturday aren't very long and I really wanted to avoid a more costly trip to the urgent care. Enter e-mail, Facebook and Twitter. E-mail: NEED KEYS. Mike, I need the keys to take Charlie to the doctor. Hope you see this. On his Facebook wall: You have my keys. I need to take Charlie to the doctor. Please call/come home. To his Twitter account: CALL HOME. YOU HAVE MY KEYS. Sure enough, about 5 minutes later, he called and said, yes, he had my keys and would come home. However, I must not have conveyed that I was in a hurry because 15 or 20 minutes went by and he still wasn't home. So back to the technology I went. Within a few minutes, he was home. Charlie and I were off to the doctor where she had to dig a bunch of wax out of his ear before she confirmed that Dr. Mom was right -- ear infection. So thanks to Al Gore, Mark Zuckerberg and anyone else who had something to do with the invention of the internet, Facebook and Twitter, Charlie should be feeling better soon and I hope to get some sleep tonight. You know what's so great about blogging? And Facebook? It's that when you're awake because of an aching tooth that you knew needed to be fixed, but you've been ignoring because you hate going to the dentist and you still owe them for the last aching tooth fix, you can have a conversation, albeit it one-way, with friends or other people who happen to be sleepless, too. And what's so great about Friday Fragments, hosted by Mrs. 4444s, is that I don't have to come up with one cohesive post. Just a conglomeration of what's flitting around my head will do. We've had one fabulous extra-curricular week around here. Annie got a part in the school play. "Into the Woods." She's Jack's (of Beanstalk fame) mother. She's having a lot of fun with it. And who knew she could sing so well? Charlie's basketball team won two tournament games this week. Last night was a hard-fought game. They were down by 1 pt with very little time left. (I say 90 seconds, he says 40). Charlie scored a basket to put them up by 1. Then on the in-bounds pass, he stole the ball and scored again, putting them up by 3. They ended up winning by 5. Woohoo! Everyone keeps telling me that I should watch "The Middle" and "Modern Family." Now that we have our cable and DVR back, I taped them. I'm loving Modern Family. The Middle is funny, but hits a little close to home. I can see Robbie in Brick (only Robbie's not quite as articulate); it's a little uncomfortable at times. I think I am going to apply to be on The Biggest Loser with Mike. So what if I don't have 100 pounds to lose? As someone at work so kindly put it, I'm short so they should take that into account. But that doesn't mean I won't keep trying to eat right and exercise between now and then. True confession: I still have Christmas decorations up. The tree and the stockings are down, but all my nativities are still up. I think I'm going to have to put "Do Not Cross" tape on the couch so I won't sit down until it's done this weekend. My plan was to spend my day off today putting it all away. But since I've been awake since 3am and I have to wake the family up in less than 90 minutes, I might need to grab a nap. Besides, I have to be on my A game to cheer on Charlie's team tonight. I hope all of you on the East Coast are fairing ok in this latest storm. We've had more episodes of snow here than I can remember for a long time. But we only get enough to be annoying -- 3 inches here, 1.5 inches there. I'm sure I'll regret saying this, but I would love to get one, big, can't leave the house for 3 or 4 days snowstorm. Don't forget my Eversave.com giveaway for people in Central Indiana (or people who wouldn't mind driving to Central Indiana for some paint-your-own pottery). One lucky person will get a $20 gift certificate to Half-Baked Pottery in Indianapolis. Click here for details on how to enter. The winner will be drawn tomorrow. Right now, your chances of winning are very good. I think that's all I've got for now, people. Have a great weekend. You can start by clicking the Friday Frags icon above and linking to a bunch of other fragmented thinkers. I received the most wonderful e-mail today. One of my friends who knows how much I enjoy The Biggest Loser sent me this link: Biggest Loser Now Casting Season 12 -- along with the news that TBL will be holding an open casting call in Indianapolis on February 26. "I am SO there," I thought. "Mike and I can go together and we'll pull out all of our fat couple jokes and this will be great!" I was never so happy to be fat, imagining myself sweating buckets in the gym on the Biggest Loser ranch. Earnestly, I clicked through the interviews with TBL casting directors and former contestants to get tips on how to score a spot on the show. Then I saw it: Contestants must have a minimum of 100 pounds to lose. I'll wait a minute while you do the math to figure out how much I weigh. I don't mind. It's just a number; like the weather in Indiana, it'll change in 20 minutes. This is a shot at the Biggest Loser we're talking about, I considered. Days and nights with Bob and Ali. Long conversations with Dr. H. I have until February 26. Oh, the weight I could gain in one short month! Seriously, that's the kind of sick and twisted thinking that goes on in my head. Fortunately for me -- and my rear end -- almost as soon as the thought of gorging on ice cream entered my brain, so did words like "Fit City," "IN Shape Indiana," and "Weight Watchers." Oh yes, those things I've already committed myself to in pursuit of a healthier lifestyle and a more fit body. Not to mention the fitness challenge I joined at work, the money I've put into my brother-in-law's Chub Club contest, and the work I'm continuing to do with the American Heart Association. I did just recently make my (not so) triumphant return to the gym. I've seen the scale moving in the downward direction. Do I really want to throw all that away? Do I really want to feel like I've been stuffed into my own sausage casing skin and have permanent marks on my waist from where my pants were digging in too tightly? Do I even want to think about resurrecting the fat dress? Sigh...I'd probably hate California anyway. I've told you how much I love Eversave.com. It's a daily deal site with lots of terrific deals for fun things to do. Today I love Eversave even more because they've given me a Save to give away here on the 4th Frog! And just like my in-laws do for the un-birthday children, they've given me the same Save to keep for myself so I don't feel left out. This giveaway is for anyone willing to drive to Broad Ripple in Indianapolis to get half-baked...pottery that is. If you want to buy the Save, which is available through Friday, January 28, it's $10 for $20 worth of paint-your-own pottery. You have until July 26 to use the Save. The only restrictions are that you must call ahead for reservations and that you may only use one Save per payment. But if your friend buys her own Save, the two of you can go together and each use your Save certificates. I've done the paint-your-own pottery thing before, though not at Half-Baked. I always have a cool idea in my head that doesn't quite translate to my piece of pottery, but I have fun in the process, so I don't get too hung up on the finished piece. I did have a platter that I painted a few years ago that I was really happy with. Unfortunately, it broke recently, which means this Save is well-timed. Awesome, huh? Even more awesome is the chance to get the Save for $0 by winning it in this giveaway. Leave a comment here about how you would use this Save (GNO, let your kids use it, etc.). Become a follower of this blog and leave a comment that you did -- or let me know that you're already a 4th Frog loyalist. "Like" the 4th Frog Facebook page and leave a comment here telling me you did (or you already do). Blog about this giveaway on your own blog and leave the link here (I'll give you 2 entries for this.). I'll post the name of the lucky winner on Saturday, January 29. Then the good folks at Eversave.com will e-mail you directly with your Save certificate. Tonight's Biggest Loser was abbreviated due to the President's State of the Union address. No weigh in tonight. But there was a challenge in which the 4 teams from the Ranch competed against the green team (formerly of the Ranch, then exiled to the Unknowns) to determine which house would win letters from home. The Ranch team narrowly won. It made me think about letters. Who writes them anymore? It's kind of a lost art, isn't it? Have you ever received a letter -- in a real paper envelope with a stamp on it -- offering encouragement for something you were facing or trying to do? How did that affect you? What was the last letter you wrote and mailed to someone? I'll issue my own challenge tonight. Write a letter this week to someone. Encourage them. Affirm them. Amuse them. Delight them. Who knows? You just might get a letter of your own in return. Labels: Biggest Loser, snail mail is another way of saying "I love you"
My kids think he is the next best thing to Santa Claus. 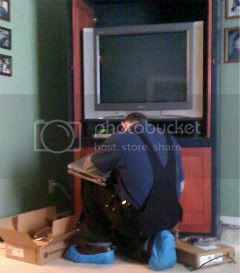 He's the AT&T service guy who came to hook up cable to our two TVs this afternoon. The great cable-free experiment lasted almost five months. If it were up to me, we would have continued on with only local channels, Netflix and Hulu. But I was outnumbered and after 17 years of marriage I know which battles to spend my energy on. To be fair, it seemed that every time there was a football game on we wanted to watch, the signal would blink and freeze and blur. What's worse, the local channels we could receive did not include the one channel that shows most of the Butler Bulldog games. And not having cable made me realize just how few good shows there are for the post-PBS Kids set. Regular TV offers either shows meant for very young viewers or shows for grownups. Not a lot in between -- though I don't intend to give up our Wheel of Fortune habit. So, we are once again a cable-watching family. We have the basic package which includes The Food Network (oh, how I've missed Chopped! ), but oddly does not include TLC, so if the Duggars have any more kids I won't be able to keep up. Probably the best part about the return of the cable -- aside from the whining of the kids stopping -- is that I have my DVR back. I've already set it to record Desperate Housewives, Grey's Anatomy, The Middle, Modern Family, Chopped and Iron Chef America. We gave it the good ol' college try, but I guess it just goes to show you can take the family out of the cable habit, but you just can't take the cable out of the family. The big achievements in life are great, but they really come once in a great while. The past few days, I've been trying to notice the little things that I can always count on to make me smile. What's smile-worthy in your life? My friend Cherie, aka the Queen of Free, invited me and several other blogger friends of hers to participate in a vzhAPPy holiday event with Verizon Wireless. We each received a Verizon phone to use (read: play with) for several weeks. 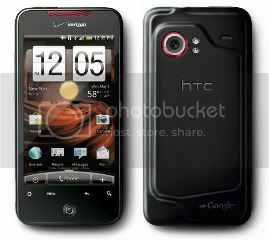 Though I'd tried the Droid X last fall and ended with mixed reviews, I was game to give another Verizon phone a try. I really liked the Incredible. Like the Droid, the screen was crystal clear. But the Incredible is smaller and easier to hold than the X and my own iPhone. The set up to get my e-mail on the phone was so easy I did it by myself in just a few minutes -- I didn't even need Mike to help me! My favorite feature of the Incredible though was the VCast Video application. I think it's a paid service that you can add on to your cell service and is unique to Verizon. In short VCast Video is AWESOME! With just a click, you can be watching last week's episode of Desperate Housewives or Grey's Anatomy or Glee. It certainly kept me entertained on a 4-hour trip to see the in-laws (no problems with coverage areas on the trip, either). If you've spent any time at all reading this blog, you know that I am a die-hard Diet Coke fan. Heck, I even had a birthday party themed around the stuff! But my Uncle Bill works for Pepsi and whenever I mention the D.C. word, it's like someone's stuck a pin in a voodoo doll that looks just like him. So for Christmas, Uncle Bill gave me a 6-pack of Pepsi Max and said he was going to convert me. Pepsi Max is a zero-calorie, sugar-free, ginseng-infused soft drink. I was a little hesitant to try it and didn't open it until I got home so Bill wouldn't see me make a yucky face and pour it down the sink. As it turns out, when we got home, we were out of Diet Coke, so if I wanted something other than water, Pepsi Max was gonna be it. I have to say, I was pleasantly surprised. Pepsi Max is definitely better than Diet Pepsi. And it has more caffeine in it than Diet Coke. 46 milligrams/serving compared to 31 milligrams/serving for Diet Coke. So if I REALLY need a pick-me-up or if Diet Coke wasn't available, I would actually buy Pepsi Max and be happy about it. There, Uncle Bill. Happy?! I actually like to eat fish and will order it at a restaurant from time to time. But I've never cooked fish...until a few weeks ago. I selected a Crispy Baked Fish recipe from my Relish! menu planning program. Full disclosure, it wasn't exactly gourmet. I used tilapia filets and dunked them in a bread crumb/parmesan mixture. It was easier and more tasty than I expected. And it was one more new thing I tried! What's up next? I'm not sure, but I might try a spin class. That would be adventurous, right? What I will still not do, however, is buy food at a gas station. Sometimes the old ways are ok. I watched most of The Biggest Loser last night. They revealed the two new trainers, but I missed that part. I'm sure you could find it on Google. What the internet and the office chit chat was buzzing about today was the twin police officers, Don and Dan, who each gained 9 pounds. As trainer Bob Harper said, you don't go to the Biggest Loser ranch and gain 9 pounds. One of the brothers, Dan, had made it pretty clear earlier in the episode that he was missing his wife and daughter very much and he wouldn't be sad to be sent home to be with them again. Most of the posts that I read and the people I talked to were furious. They agreed with Bob who pointed out that there are thousands of people who wanted to get on that show and have the opportunities TBL provides and this guy -- with added insurance from his brother's gain -- basically threw that opportunity away. I understand the point, but I don't agree. It relates to last week's thoughts about motivation. Most people who lose a significant amount of weight have something that triggers their success. For some it's a health crisis. Sometimes it's an insult or a well-intended but still offensive comment. I think the success trigger is different than just being motivated by a class reunion six months away. In my mind, the trigger is something deeper and more intrinsic. For Dan, the trigger was the realization that he did not want to be separated from his nine-year-old daughter. As Harry Burns in "When Harry Met Sally" said, "when you realize you want to spend the rest of your life with somebody, you want the rest of your life to start as soon as possible." I think it took him leaving his daughter and being away from her for several weeks to wake him up to the fact that if he didn't do something about his weight, that separation would be permanent. And once he figured that out, he had what he needed most to succeed. It's 3:59am on January 17 and I'm sitting at the kitchen table with my laptop, feeling significant -- albeit self-imposed -- pressure to write something both eloquent and politically correct for the observance of Martin Luther King, Jr. Day. I've googled MLK quotations, hoping for something to spark. I've considered and rejected probably a dozen ideas. I considered writing about Ruby Bridges, the little black girl from New Orleans who was escorted to school by federal marshals in the 1960s when schools were forced to integrate, and how her story fascinates me. I gave some thought to writing about my long-lost and black friend Michael Burdett, who I went to high school with and who I last knew to be a teacher in Cincinnati, but who is nowhere to be found on Facebook or my google searches. I worry that the use of the word "black" might be offensive, but think that "African-American" feels a little too PC. Writing about how I was fearful for Robbie to go to an inner-city school for a march and Mass honoring Dr. King seems a.) that it might make me seem prejudiced and b.) pointless, considering the event happened on Friday and went well, other than Robbie's determination that it was the most boring field trip ever. Who goes to church on a field trip? I considered putting off posting until tonight so I could attend a lecture on campus by Minniejean Brown Trickey, one of the Little Rock Nine who desegregated Central High School in 1957. But I'd have to miss Annie's volleyball game to attend, so I'm not sure about that. I thought of writing about how it seems that Latino might be the new black, but rejected the idea because I'm not really scholarly enough to write about it intelligently. I considered posting the video of Charlie reading Robert F. Kennedy's speech in Indianapolis on the occasion of Martin Luther King, Jr.'s death. Alas, nothing seems to fit what I'm feeling I should put out there. A great man deserves a great post. King once said "The ultimate measure of a man is not where he stands in moments of comfort and convenience, but where he stands at times of challenge and controversy." Perhaps I am too rooted in comfort and convenience and that's why I've struggled with what to say on this day. 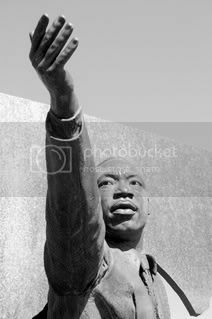 But I suppose if even one of the ideas I put out there has made you stop and think for a moment about Dr. King and his legacy, then maybe I have done my part to honor him. Mrs. 4444s Friday Fragments seems like the perfect way to come out of the "ohmygoshwhoisthrowingupnowijustwashedallthesheets" fog that I've been moving in for the past two weeks. When you're finished here, be sure to pop on over to her blog for other Friday Fragments. Visiting Mrs. 444s place tonight was a wee bit depressing because she was all happy about the Packers still being in the playoffs. I had almost forgotten the sad tale of my Indianapolis Colts until I read her cheeriness. Gee, thanks. Speaking of thanks. Thanks to those of you who voted for me in the Linking Indiana blog contest. If you direct your eyes to the right, you'll see that the 4th Frog Blog was not only the winner in the "Defies Categorization" category (is that an oxymoron? ), but also came in as one of Indiana's Top 10 blogs. I don't put a lot of stock in it, but it was fun to drop those ribbons onto my layout. Congratulations to my friend Sharon who earned a nod as one of the top 20 "best parent blogs in Ohio." If you haven't checked out Sharon's blog, The Bird's Nest, pop over there today. Does anyone pay full price for anything anymore? You've probably heard of Groupon. But how about Eversave? It's a Groupon-like deal, but in my area I like the deals a little better. I really like the fact that I won a $10 credit in a drawing on their Facebook page! I'm so ready for a change of look on the blog here. I'll keep my jumping frog, but not sure what else I plan to do. Smaller fonts for post titles, for sure. Do you have any thoughts? I'd love to hear them. I heard something very sad and very lovely today. The 9-year-old girl who died in the Tuscon, AZ shooting was buried today. Her casket was donated by Trappist monks in Iowa. They have a Child Casket Fund they use to provide donated or discounted caskets to families who lose a child. If you are interested in supporting the fund, click here. It seems Charlie pulled a muscle in his leg at basketball practice today. After practice he learned -- the hard way -- the importance of being careful where you put the Icy Hot. Oh, all right. I admit it. I DO snore sometimes. I know this because I have, on occasion, woken myself up with my own snore. My snoring seems to be tied to my weight. Once I hit a certain weight (and no, I won't tell you what it is), the snoring gets worse. It's not just snoring, but officially sleep apnea. I have a CPAP machine that I am supposed to use to help maintain my airway while I sleep. It's been quite a long time since I've used my CPAP machine. When I lost 30 pounds, the snoring issue was gone, as was the waking with a headache and the crushing fatigue. However, in recent months, it's become apparent that I need the CPAP machine again -- or so Mike says. Last night he took the boys sledding -- on one condition. That I would use my CPAP machine. My snoring has been keeping him awake at night, though I'm not sure why. I sleep through it just fine. I agreed to use the machine. So when I went to bed at 1am last night, I took the time to wash out the tubing, the fighter pilot-looking mask, and the water reservoir. It took me about 10 or 15 minutes to fall asleep, getting used to continuous flow of air and the soft hum of the machine. When I woke up this morning, I rolled over to find Mike already out of bed. He was asleep in Robbie's bed. "What are you doing in here?," I asked. "Your CPAP machine was making noise and I couldn't sleep," he yawned. Last night on The Biggest Loser, Alison Sweeney informed Bob & Jillian's team that they had been "destroyed" in last week's weigh-in by the "Uknowns," the team training with Ninja Guy and Boxing Gal. Ali gave Bob & Jillian's team a challenge. Win the weigh-in this week and no one would be eliminated, plus the winning team would win $10,000. The team rallied, worked hard, worked together and came out victorious -- keeping their team intact and earning the money to split among themselves. But it got me thinking about motivation. It doesn't seem that Bob & Jillian's team was motivated most by the money. It was kind of a nice bonus. They were certainly motivated by the promise of immunity for everyone, the chance to stay on the ranch for one more week. But it seemed to me that they were most motivated by pride, not wanting to wind up in second place again. Then I started thinking about what motivates me to do certain things. In the case of last year's Go Red for Women Better U challenge, I was motivated to eat right and exercise in large part by the knowledge that I'd be parading in front of 1,000 people at the Go Red for Women luncheon. Being the the first-born people pleaser that I am, I am frequently motivated by a desire for approval, which leads to me to sometimes say yes to things when I'd really rather say no. Sometimes I'm led to do things out of a sense of fear (though that same feeling can stop me in my tracks as well). As parents, we often get our children to do things by either holding out a carrot -- a late bedtime, extra videogame time, a treat at the store, or by holding a negative consequence over them -- early bedtime, no videogames for the day, an extra chore. But as has been shown by the competitors on season after season of The Biggest Loser and in countless other life examples, those who are most successful at whatever they set out to achieve are those who find their motivation from within. So my question is where does that internal desire come from? How do we nurture it in ourselves? How do with cultivate it in our kids? What accomplishment are you most proud of and what motivated you to achieve it? 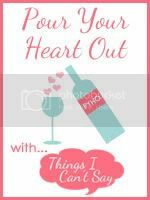 Because this is sort of thought-provoking post, I'm linking it up with Shell's "Pour Your Heart Out" meme for today. while singing "Happy Birthday" twice before I sat down to write this germ-inspired post. If you follow along on the 4th Frog Facebook page, you probably know that last week the nasty V&D bug hit our house. Everyone -- except me -- fell victim. Some got the V part more than the D part. Others got the D part worse than the V part. I just got to clean up after it all. But I was feeling quite victorious and of superior immune system capabilities because I escaped the week unscathed. A little piece of advice: Never underestimate the V&D bug and never issue a challenge such as "knock on wood, I was the only one in the house who didn't get sick." Yep. Today, it was my turn. It started last night, I think. I got home from the gym (where all I did was walk the track for about 50 minutes because I didn't want to hurt myself after having been away for so long) and my stomach felt queasy. I thought maybe my blood sugar was low from the exercise, so I had a little something to eat. It didn't really help much, but there was nothing more significant than a little seasick feeling. Overnight, I woke every hour on the hour, not really sick, but not feeling well either. When it was time to wake the kids for school, it was clear that I would not be going anywhere other than the, um...ladies room. I moaned a little, whined as I climbed back into bed and fell back to sleep. And that's pretty much how I spent the next two hours -- shuffling back and forth between the bathroom and the bed. Mike, bless his heart, went to store and got me some medicine and 7-Up and I thought that I'm not sure I was that nice when he was sick last week. I couldn't really linger on the thought because I was struck again by what can only be described as a Harry Potter-esque spell that turned my insides into liquid. When I first figured I'd be staying home, I thought perhaps I'd get caught up on the laundry a bit and maybe take down some Christmas decorations. Who was I kidding?! Seriously, my day went bathroom, sleep, watch a little TV, rinse and repeat. About an hour after the kids got home from school, I emerged from the bedroom to help with homework. Forty-five minutes of first grade reading and fifth grade math was enough to sap any energy I might have thought I had. So it was back to bed until about 30 minutes ago. I still feel like I've been run over by the garbage truck, but I can be further than three feet from the bathroom, so that's progress. If you stuck with me this long, I'm impressed. Thanks. And just in case, go wash YOUR hands. Last week I posted about a menu planning service that I signed up for. I selected and shopped for five different meals. Because we were out of town for a funeral for a few days and everyone but me had a stomach virus, I've only made two of the five meals. The first was crispy baked fish. I was surprised at how easy it was to make. I've never cooked fish at home before. I used frozen tilapia, so it wasn't anything exotic. I don't remember what was in the "crispy" part except Italian bread crumbs. I served it with steamed broccoli and canned peaches. We gave the fish about a B-. Mike and I thought the breading needed a little more kick to it. Like maybe some pepper or something with a little spice. But it was so easy to make that I'll definitely try it again. Tonight we had baked penne with ricotta and spinach. Robbie came up as I was making it and asked "what smells so good." I don't think he's ever asked that before -- unless I was baking brownies. I thought this dish was very good, but everyone else only gave it a B to a B+. It called for crushed red pepper flakes that I left out because I didn't think the boys would like that. Turns out they weren't so keen to eat pasta without red sauce, so next time I'll put the red pepper in. When I make it again, it will definitely be a weekend because this took a while to make. The recipe says 25 minutes for prep. I think it took me longer because I'm not a seasoned cook (pun intended). Tomorrow's dinner -- drumsticks with lemon pepper marinade -- is already in the fridge. The meat for Tuesday's slow cooker beef tacos is defrosting. Wednesday will probably be leftovers. I might hurt myself if I make dinner four nights in row (five if you count last night's hot ham and cheese sandwiches). My kitchen cabinets are in desperate need of cleaning out. I found 4 dinosaur cookie cutters, but no teaspoon measures. I need a colander bigger than a grapefruit. I need to read through the recipes and do some prep before I jump in on the first step. Tonight, the onions and garlic were done cooking and I hadn't even cleaned and chopped the fresh spinach yet. I have no idea what the difference between white wine vinegar and balsalmic vinegar is. I'm not sure what a dutch oven is -- but dinner turned out ok without one tonight. Some of the side dishes are a little high maintenance. I'll try making them once -- but I'm thinking frozen sweet potato fries will work just as well as hand-cut sweet potato fries. I plugged in 6 servings for this week's menus. I think next time I'll plan for 4 servings each. The boys don't eat that much and while I'm ok with leftovers, there can be too much of a good thing. Sorry I don't have any pictures to share of my culinary adventures. Right now I'm working on actually making a meal. Maybe in a few weeks, I'll be ready to make and photograph the food. Last season, I didn't watch The Biggest Loser. I just needed a break. But earlier this week, I watched a "where are they now" special and found myself drawn to the show again. So I sat down to watch the opening episode of the new season, "The Biggest Loser, Season 11." I'm not sure if TBL posts will become a regular occurrence here again or how I'll write about them. I'm leaning more toward exploring one topic from the show than providing a re-cap of what happened on the latest episode. There are twin brothers on the show, again. And another man from Tonga named Moses, following in the footsteps of Philippe, Sione, Sam and Koli. Maybe they should just start a Tongan BL series. I mean, honestly, the Tongans are fat people. I get it. Aren't there any fat Germans or Englishmen who need an intervention? There was the falling down and throwing up of the first workout. There was Jillian screaming and Bob taking someone outside the gym to talk -- the equivalent of a psychiatrist's couch. One of the funniest things I heard was Jillian saying "I don't want to yell. Do it because I asked you to, not because I yelled," and Bob responding, "Asking Jillian not to scream is like asking the grass not to grow, the fish not to swim, the lions not to roar. Jillian's always gonna yell at people." Not that Bob's incapable of being in-your-face. At one point he said to Arthur, "Of course you want to lay down. You weigh over 500 pounds!" Funny, but harsh. There's a new twist, as well. Two new, mystery trainers. I'm calling them "Ninja Guy" and "Boxing Gal." The teams had the opportunity to sign on with the new trainers and have four weeks of immunity or to work out with the successful, known quantities of Bob and Jillian. I said I wasn't going to re-cap the episode, didn't I? That I was going to explore one topic from the show. So here goes. Seven of the 11 pairs on this season are parent-child duos. At least one mom spoke of feeling guilty for her child's weight issues. That struck home for me. I've been overweight for the better part of 30 years. I don't for one minute hold my parents responsible for my weight issues. They raised 5 kids and I'm the only one who struggles with weight. What weighs heavy on my mind, no pun intended, is how my habits and choices regarding food have impacted my own family. Even when I think I'm being sneaky with my own bad habits, they are more aware than I know. Whether it's a propensity to drink Diet Coke instead of water or the couch that's imprinted with the shape of my hind end, I don't always give my kids the best example. Annie takes after me and has already found that food is both her friend and her enemy. The boys are pretty lean right now, but I worry what will happen when they grow up and they find themselves with less built-in activity and more sedentary time on their hands. Some people watch The Biggest Loser out of sheer voyeurism, wanting to gawk at people whose skin is painfully stretch across their stomachs and whose weights reach unbelievable numbers. Others watch hoping to see Jillian rant and rave. Some tune in for inspiration in their own weight loss and to cheer on those working to regain their lives. Watching the show the other night and seeing all those parents and children was like holding a mirror up to my own future. I recently wrote at Fit City about moving two steps forward and one step back. This first episode of The Biggest Loser Season 11 was an inspiration to me to keep my eyes fixed ahead and move forward, for myself and my family. Or I will be as soon as I get back from the store. Today I logged onto Relish! to build my menu for the week. The process was pretty simple. There were 15 entree/side pairs to choose from. (New menus are put up every Thursday.) There were also 10 freezer meals to choose from. And if those 25 meals didn't offer enough variety, there was a list of meal ideas broken down by categories like: Kid-friendly, Lower Calorie, Slow Cooker, Vegetarian, Simple Gourmet, Budget-friendly -- and more. I did have to call the customer support number to figure out that if you offer over the letter code at the end of the meal idea, you can figure out which category it belongs to. If we end up just loving one of the meals, I can go back into my Relish! account and mark it as a favorite to add to my meal plan whenever I want. I could have chosen as many menu items as I wanted, but they recommend starting with 5 to keep your grocery list and budget reasonable. You can choose how many servings you want -- 2, 4, 6, or 8. Relish! scales the recipe for you and then builds your grocery list. The grocery list organized by section of the store and is marked with a code for which recipe the item will be used in. That way if I decide not to make the drumsticks (A), I just go through the list and cross off everything that is marked with an A. Is that not awesome?! Even better, I found a free iPhone app that will keep my menu and grocery list as close as my phone. The good news for any of you kitchen-challenged folks out there is that though the Eversave deal is over, SavvySource.com is offering the same deal right now! You'll pay $16 for six months of customized menu planning. And if you "like" the offer on Facebook, you'll get another $1 discount! For a fraction of what it costs to go out to dinner, you can get six months of just-right-for-your-family menu ideas, recipes and grocery lists. Let me know if you try it. I'll let you know how our meals are this week. And if you're one of those people who are never at a loss for what to fix for dinner and who love to cook, I'm free next Tuesday. I'm a bit of a perfectionist, but not the must have everything clean and organized type of perfectionist (much to the disappointment of my husband). I'm the kind of perfectionist who always wants things to be just right, even though actually making things just right seems elusive. Sleep more (I write at 11:30pm). Go to the gym 5 days a week. Cook more often (frozen pizza does not count). Start FLYing with the FLY Lady. Establish before school/after school/weekend chore routines. Clip -- and use -- more coupons. If I really thought about it, I could make this list go on and on and on... Is it any wonder I have found myself having to take deep, calming breaths over the past few days? So I'm trying to just make a few small changes. I won't call them resolutions because if I have trouble following through, I don't want to think I've failed. Rather, I'm more about giving it a good try. I will try to drink Diet Coke only in the morning (as my "coffee). I will try not to eat sweets, except maybe one treat once per week. Trust me, if I could do that it would be a heee-uuuuge victory. I'm not trying to rid myself of those messy perfectionistic tendency. I'm just trying to live with them. Charlie: "Mom, what does 'legitimate' mean? Me: "It means real or truthful." Annie: "It means 'fo shizz." We spent New Year's Eve at my parents' house with all my siblings and their families. There were 22 of us together in all -- 23 if you count my brother's giant, 100+-pound greater Swiss mountain dog. It was the best New Year's Eve I've had in a long time. We kept it simple, ordering pizza for dinner and enjoying snacks that each of us pitched in for. We celebrated Christmas, creating a frenzied storm of flying wrapping paper and delighted squeals. All the grandkids (10 of them) got Pillow Pets. All the married kids got very cool family name plaques from AlphaPics. There were multiple "puppet" shows (starring the Pillow Pets) put on by the nieces and nephews, complete with paper "tickits," and all the grown-ups dutifully watched and applauded. We played Catch Phrase and "Three Truths and a Lie." The latter was quite fun. I learned all sorts of things about my siblings and in-laws that I didn't know before. Of course, the real dirt was divulged later in the evening, after the clock had struck midnight and a few folks were either a wee bit tipsy or just punch-drunk tired. It was a fun, joyful -- and educational -- way to celebrate the New Year. Laughing until you literally wet your pants is hereditary (no, it wasn't me), as is staying up until all hours of the night (guilty for that one). If you're going to have 22 people and 1 very large dog in one house for a long period of time, bring plenty of air freshener -- and GasX. It's not just my husband who is happy to help -- if asked -- but who otherwise is happy to sit on the couch. The amount of noise generated by 10 kids is frighteningly huge. I am still my mother's favorite. Ok, she didn't come right out and say that, but I know that's what she meant when she said, "Please pass the pizza." Just as married couples shouldn't hang wallpaper together, they also shouldn't be on the same Catch Phrase team. And for the record, dear, I still don't think "Arms Blown Out of Proportion" was just a bad guess. There are dogs in the world who don't steal food from the table. Almost-14-year-old-girls will still play with Barbies given the opportunity (and no friends who are watching). It's a good idea to do a head-count every once in a while. The warmth of family togetherness with 22 people in one house lasts approximately 24.5 hours. All-in-all, it was a great way to finish the old year and ring in the new. How did you greet 2011?